Cats Slot Machine - Just because cats are awesome! 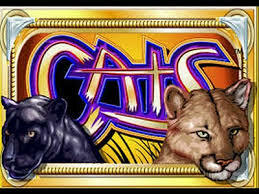 Cats slot is powered by IGT and is an exciting and popular game about African wild cats. There are standard symbols as well as split ones, meaning that you can have multiple winning combinations in one spin. Along with this comes a Free Spins round to increase your chances of winning even more. You can play on mobile from just 0.30 per spin! In Cats slot machine the Split Symbol feature means that each wildcat is represented by either a single or double symbol. This means that you can get ten matching symbols on the reels for much higher wins. The double symbols are also Wilds in the game, increasing your winning chances even more. Enjoy higher winning combinations and up to a 10,000 payout when combined with the Free Spins feature. The Free Spins round is one of the exciting features of Cats slot and is only activated by five or six paw print symbols on the central reels. For landing five paw prints you will receive five spins, while six will award ten spins. If you are lucky enough to land more during the feature, then you will receive even more Free Spins! Why Play Cats Slot Machine? Cats slot is not only fun to play, but also very rewarding too. As you interact with the different features of the game, you will enjoy some immersive gameplay. It is a classic and simple slot which all players will find engaging. You can play for real money or just take a wild African adventure completely for free.